Gathering Collie dog information can be somewhat confusing, because the word collie is used in no less than three breed names: Border Collie, Bearded Collie and simply Collie. 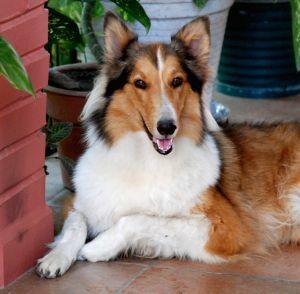 The last breed comes in two varieties, Rough Collie and Smooth Collie. The term Farm Collie was used for a wide range of different herding dogs in North America until the mid 1900s, but it not a breed name. In addition to this, the small Shetland Sheepdog is sometimes mistakenly referred to as Miniature Collie, but the Shetland Sheepdog is a completely separate breed with its own breeding history. The Collie dog information in this article will focus on the Rough Collie, the type of Collie that rose to fame with the advent of the extremely popular Lassie movies. An imperative part of proper Collie care is to provide your dog with both physical and mental stimulation. This is a working dog that loves to be active and use its brain, and without sufficient amounts of exercise the Collie can develop serious behavioural problems. You do not have to take your Collie out for miles and miles of running; the important thing is that your dog is given plenty of opportunity to be active and engage in interesting activities. Coat care is a mandatory part of Collie care, since the Collie coats turns into a matted mess without regular brushing. This breed sheds a lot, and if the hair is not brushed away it will for these mats or end up all over your home. Even if you brush your Collie several times a day you should expect quite a few hairs ending up where they shouldn’t be. Regular vacuum cleaning is definitely called for with a Collie in the house. The Collie dog puppy is a charming little fellow and a lot of children and adults dream of owning their very own “Lassie”. Before you decide to get a Collie puppy, you should however ask yourself if you are willing and able to provide this dog with the required amount of care for the next 10-15 years or even longer. You should also ask yourself if a “Lassie” really is the perfect breed for you. Are you prepared to spend time on coat maintenance every day? Can you handle heavy shedding? It should also be noted that Collies can become very barky if left alone too much and they have a tendency to heard and chase children and pets. When Collies herd, they nip the heels of the objects that “need” to be herded. The Collie dog is an intelligent and lively creature that loves to work. If you have no sheep for it to herd, you have to provide it with other forms of Collie dog training where it is allowed to use both body and brain. Collies are for instance known to like advanced obedience training and agility. During Collie dog training, it is important to keep in mind that Collies are extremely sensitive to stress and harsh words. Saying NO in a firm voice is enough for your Collie to get the message, there is no need to yell or punish. Collies can even start behaving neurotically when someone else is being punished, e.g. if you have a habit of constantly yelling at your partner or your children. According to the American Kennel Club, the aim of Collie dog breeding is to create strong, intelligent, responsive and active dogs. A Collie should be lithe and carry no useless timber. The deep chest should exude strength, while the well-bent hocks give a sense of speed and grace. It is very important for each part of the body to be in harmonious proportion to every other part and to the whole. Timidity and frailness are not desirable, and viciousness or sullenness must also be avoided when breeding Collie dogs. Due to numerous books, movies, radio programs and television episodes, Lassie is today one of the most famous fictional dogs throughout the world. 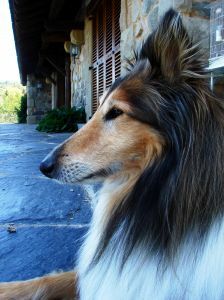 Unfortunately, this created huge problems for the breed because suddenly everyone wanted to own their own “Lassie dog”. Disreputable Collie dog breeders started to produce as many puppies as possible, with little regard to the health of the breed and the individual puppies. To make things even worse, Collies ended up in the hands of owners that did not provide them with the required amount of exercise and stimulation, and the breed soon got a bad reputation for being barky, jittery and blatantly crazy. Reputable Collie dog breeders are today striving to bring the breed back on track and preserve the good strains by only breeding healthy and mentally stable Collies and selling well socialized puppies to homes where their needs can be met. When buying a Collie, it is very important to make your purchase from one of these reputable Collie dog breeders, otherwise you risk getting an unhealthy or mentally ill dog. The Collie dog price varies a lot from breeder to breeder, and instead of staring at the price tag you should employ your investigative skills and find out what you actually get for your money. Has the Collie puppy been vet-checked, vaccinated and de-wormed? Are the parents vet-checked, happy and healthy, and of good ancestry? Are the puppies being well cared for during the important first weeks of their lives? Trying to save a few bucks by going for the lowest possible Collie price without investigating why it is low can be a very expensive decision in the long run.